Find how Thermistor elements work on this link. Nota: The thermistor elements in these sensors have resistances of 6000 Ohms and 30,000 Ohms at 25°C. When combined with the Optional Resistor Sets shown above, they will provide a linearized output over a defined temperature range. For additional information, click this link. 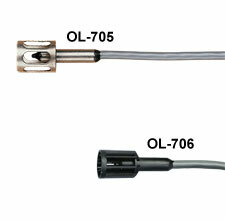 Options: For additional cable length add the required length to the Model Number and add $1/ft to the price.